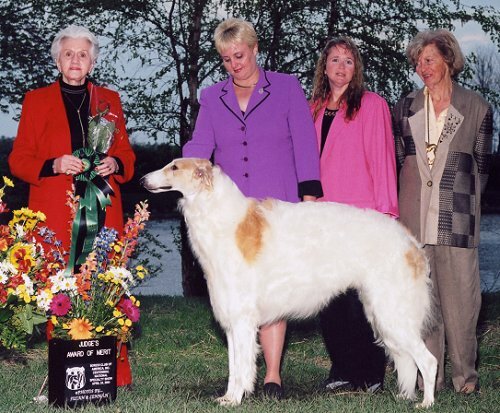 I met Kalipso and his lovely littermates when I visited with his breeder Nadine while attending the Irrational Grand National in July 2002. All the babies were so tempting but Kalipso stole my heart. I was so excited when Nadine said he could come live with me and Victor! A stunning gold/white boy, reminiscent of his mother Nofretary, he also reminded me of Stone at first glance. We enjoyed watching him grow and had many fun times with this boy! 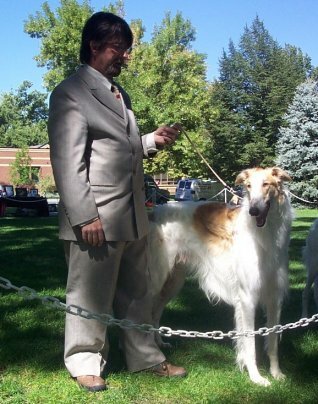 "The class, Dogs 12-18 months, had great depth in the quality of the dogs. My winner of the class was eventually my Winners Dog. 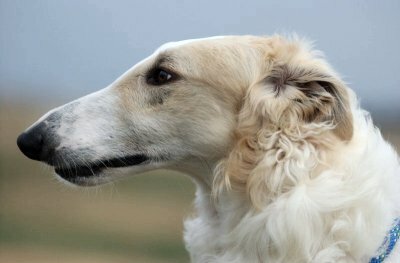 Rising Star Kalipso was a striking young dog with lovely, easy movement, plenty of reach, and was true coming and going. He did carry his tail a bit high, but he has a presence that cannot be overlooked." Kal also enjoyed playing running games! At his first ASFA trial he was first of 9, earning 36 points and a placement towards his field championship. In his prime, he was amazingly agile for such a big boy - and light on his feet! 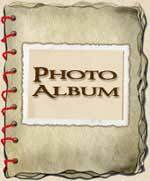 He completed the requirements for his ASFA field championship in November 2003. He earned his JC the weekend before finishing his ASFA title, and in his first AKC trial weekend won a 3- and 5-point major. He ran in Best in Field at the Sunday trial and came away the BIF Winner!! He also competed a little in LGRA and NOTRA racing. doing what he loved best - RUN! Tragically Kalipso was injured in an accident during a Best in Field run. After a fall when another dog's front legs became entangled in his rear legs, Kalipso was diagnosed as having a bone chip in his shoulder. We elected to have arthroscopic surgery performed and afterward he was lame pretty much every day after exercise. We were heartbroken as he was close to completing advanced coursing titles and we had plans to have him out as a special in 2006. We are in the process of researching further treatment for him. In the meantime he remains a loving companion who has given us a beautiful son to carry on with (Solo). In 2009 while playing chase early one morning, Kal ran into one of the crossfences in our yard and suffered a spinal shock, and was paralyzed from the neck down. The local ER clinic had him standing and walking with assistance by the end of the day, and he was able to walk, albeit unsteadily, by the next afternoon. He continued to improve and regained about 85% mobility. Despite being a bit handicapped, Kalipso's attitude remained high on the happiness scale and he acted like he had never seen a bad day in his life. His unwavering cheerfulness remained for several more years. Sadly, he began to lose his mobility gradually over his last months, and we had to say goodbye when he was 10 1/2 years of age. Victor and I are very grateful that Nadine allowed this big sweetheart to come into our lives. 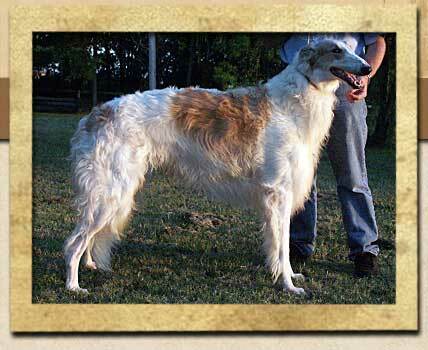 Kalipso is the youngest Borzoi to acheive an AKC Dual Championship.